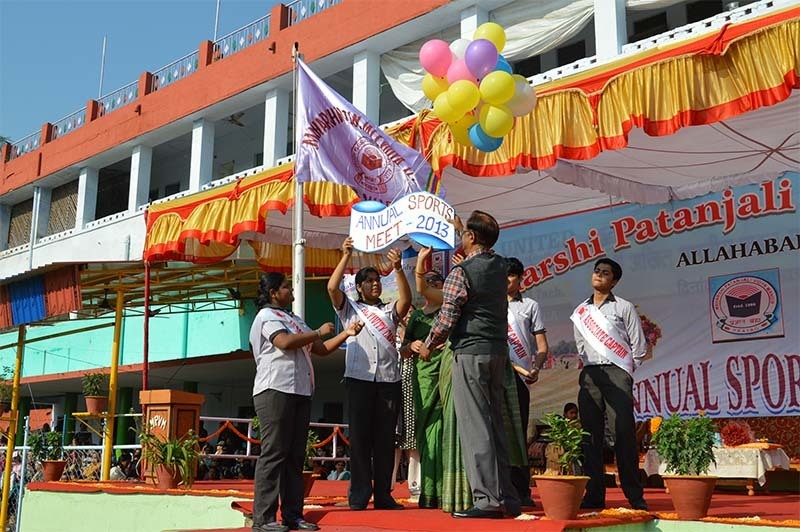 Two thousand students of Maharshi Patanjali Vidya Mandir put up a grand show at Madan Mohan Malviya Stadium as they celebrated their Sports Day to prove that high academic standard was not the only laurel in institution's cap. With the arrival of the Chief Guest, Shri Kumar Kamlesh (IAS), Commissioner, Allahabad the sunny afternoon came alive with the spirit of enthusiasm and camaraderie. A befitting welcome of the Chief Guest and other distinguished guests was given by the Principal Mrs. Sushmita Kanungo. In her address she said that the Gold Medals are not made of gold alone. It is a symbol of hard work, dedication, sincere efforts, grit and guts. Appreciated the students who have work hard incessantly for so many days and have brought glory to their house. The meet was declared open by Shri Kumar Kamlesh at the arrival of the Torch Bearer. The majestic run by Kriti and Sachin bearing the lighted mashal in their hands lit up the hearts of all the spectators. 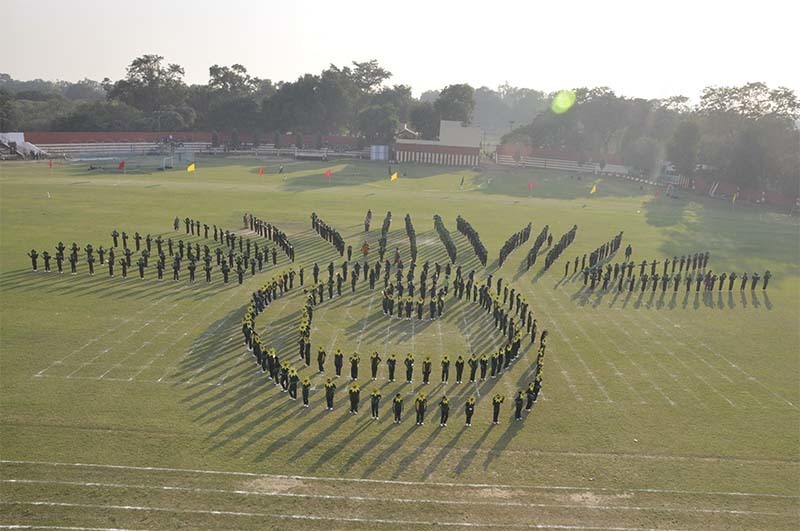 The first of the many splendoured performances was the March Past by the five Houses Vashishtha, Valmiki, Vishwamitra, Vivekanand and Vyas led by the Captains Shivang, Kritagya, Piyush Mishra, Nidhi, Shailza. The Houses were led by the school captains, Pranshi Jaiswal and Ria Srivastava, Associate captains Anushka Dey & Indraneel; Activity captain Abhilasha, Sathak Ray. It was followed by oath ceremony, in which the Sports Captain Kriti administered the oath to the participants. 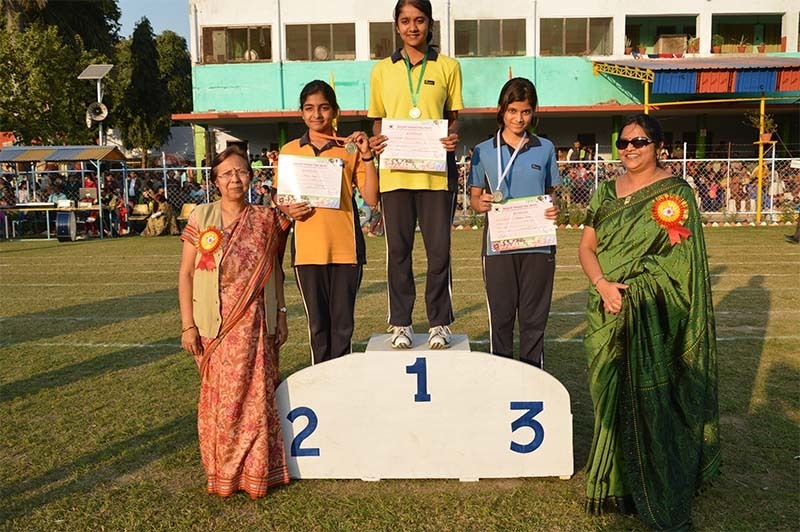 The spectators appreciated the keen and healthy rivalry of the track and field events by cheering the energetic athletes. Stiff competition, the House spirit, and the dedication for the glory of the House was distinctly visible on all the track events. The special attraction was the March Past by the students representing sports icons from various field that have brought laurels to the nation; prominent among them being Milkha Singh, Sanya Mirza, Sachin Tendulkar, Sanya Nehwal etc. A treat of colourful and spectacular rhythmic mass drills accompanied by melodious music were a veritable success. The Drill display 'Fitness Freaks' by Class VII & VIII girls and boys immersed the audience in the swift and intricate movements. The girls dressed up in their spotless resplendent white and the boys in their shining black dresses were a feast to the eyes. 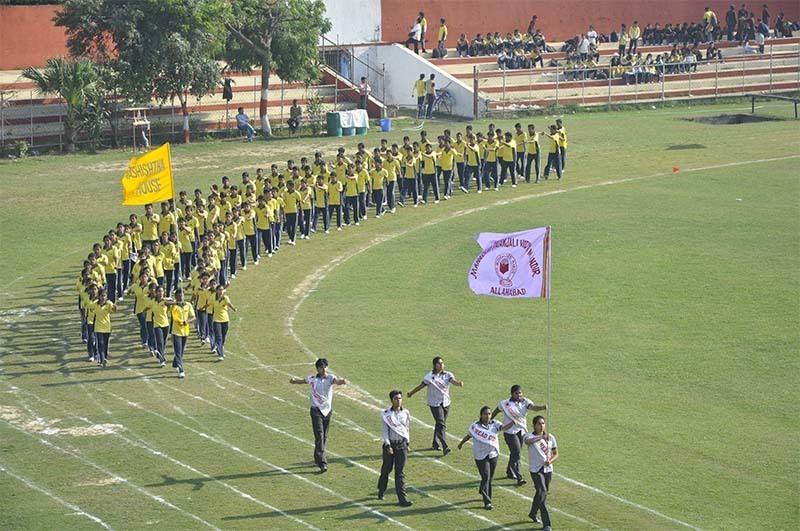 A magnificent display was given by the students of Class V & VI through their drill 'Eco Brigadiers'. It was an exhilarating display blending sublimely the tantalizing colours with the dexterous movements that were executed with methodical perfection. The Pyramid Formations by the five Houses was again a remarkable display of precision and co-ordination. The undaunted spirit was seen in the 'Balloon Balance Race' by the Parents and the 'Coin Relay Race' by the Teachers. The Class IV employees too participated with the same enthusiasm on the track. The Chief Guest had all praises for the school. He appreciated the various performances and he congratulated the school for presenting a wonderful show and gave his blessings to the children. He praised the school for naming Houses after the famous rishis of the nation. Vote of thanks was proposed by Prof. Krishna Gupta. Hony Secretary of MPVM. In her address she said Sports Field vibrates energy and enthusiasm. She expressed her gratitude to the Commissioner for his visit and sparing his valuable time. She appreciated the literary bent of the couple towards education. She encouraged the students for their spirit and thanked all guests for their participation. 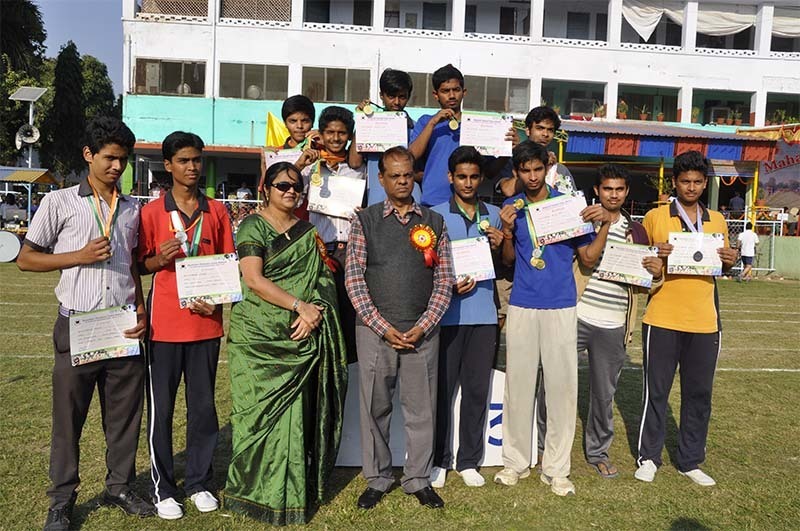 The Valmiki House was declared the winner House followed by Vyas House, Vishwamitra House, Vashisht House and Vivekanand House . The closing ceremony concluded with jubilations mingled with the fireworks after the handing over the flag to the Principal by the sports captain.